Thanksgiving is one of my favorite holidays to bring into the classroom. Why? Because teaching children the importance of being thankful and grateful for all we have is so powerful and important! 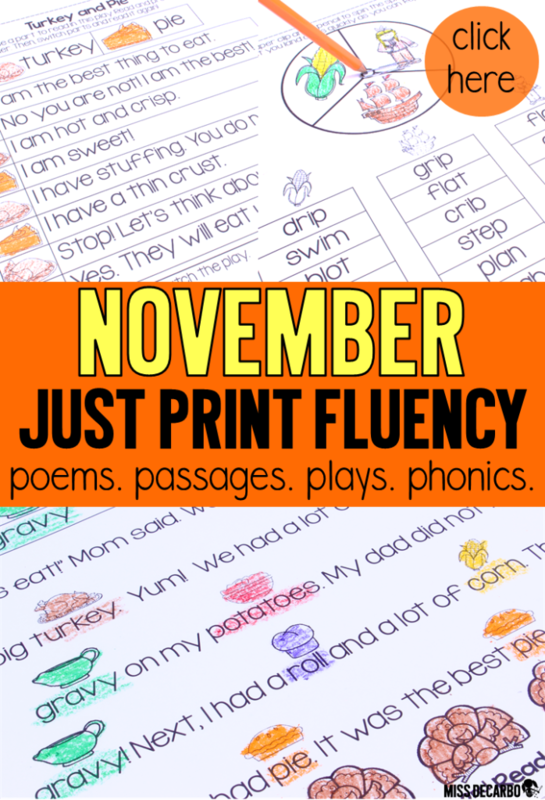 Along with reading lots of Thanksgiving themed books (which I’ll list at the end of this blog post), we also participate in a lot of fun Thanksgiving literacy activities during the month of November. 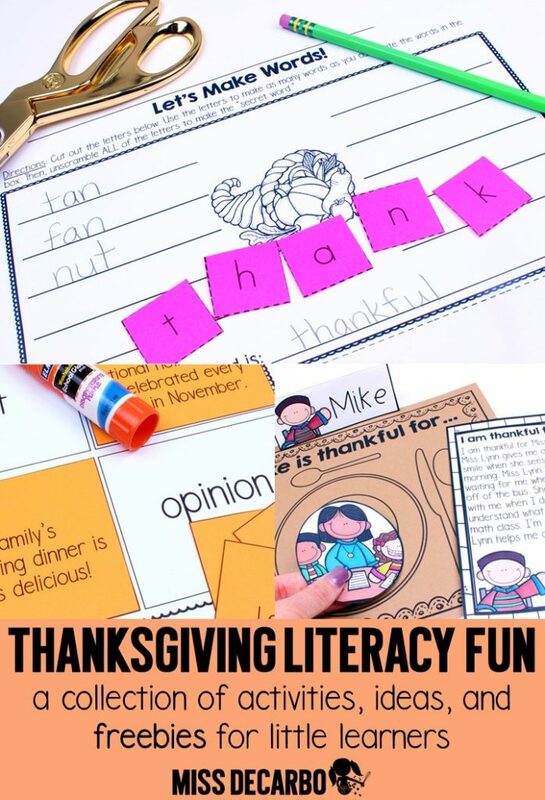 In this blog post, I’ll share some of my favorite Thanksgiving literacy activities for primary learners, sprinkle a couple of Thanksgiving literacy FREEBIES in for you, and share a favorite website and app that I like to use in my first-grade classroom. I love bringing word building into my classroom. It is so important for students to understand how sounds work together to make words. 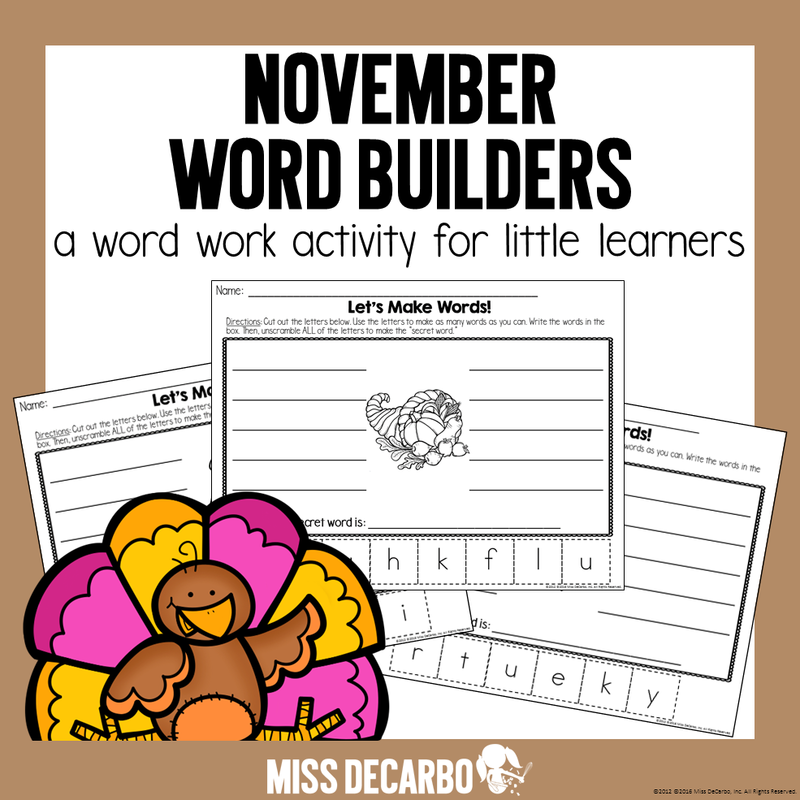 In this November Word Builders pack, your students will build as many words as they can think of using the letters provided on each page. 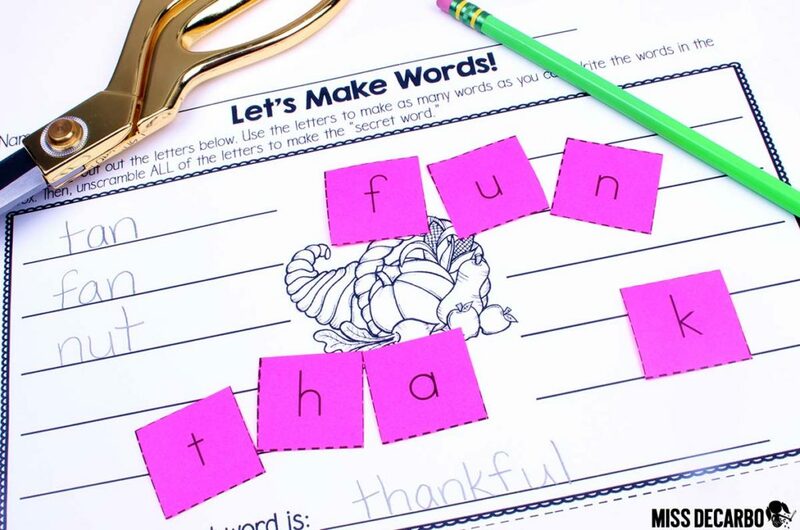 Then, students will unscramble ALL of the letters to unveil the SECRET Thanksgiving word! 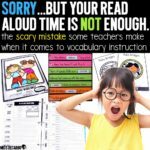 My students LOVE these word builder activities. They especially enjoy “racing” each other to see who can come up with the most words. It seems like their words are always spilling onto the back of the paper. 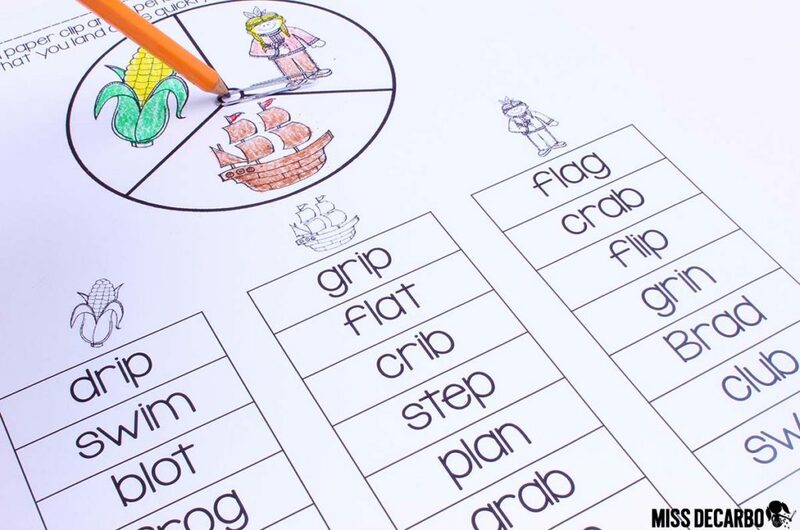 In the picture below, you can see how this activity would work for a multitude of skill levels and grade levels. Based on your students’ word knowledge, they can make as many small words as they can, or challenge themselves by building larger words. 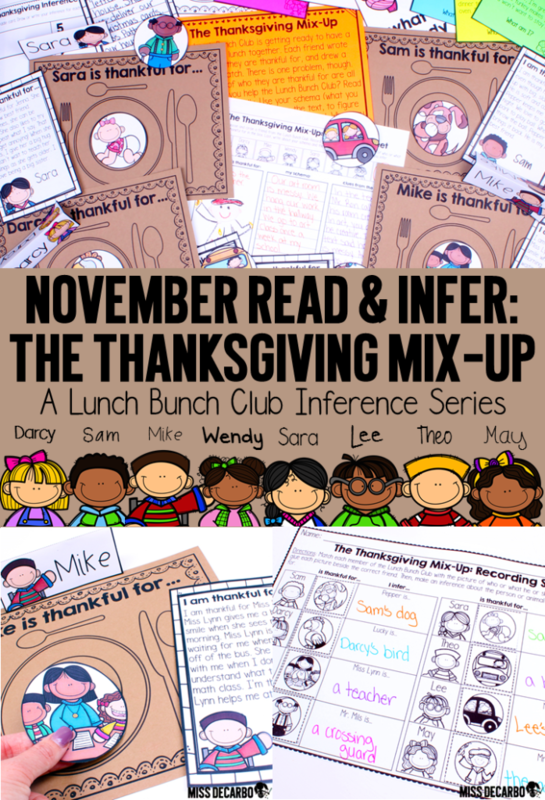 Students will carefully read the letters, and use their schema and clues from the text to infer who or what each friend is thankful for. 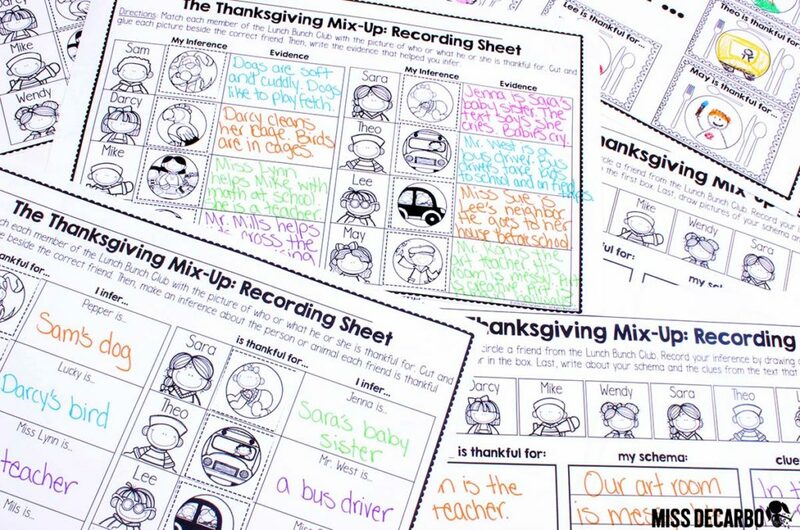 The students can work together to match each picture to the correct Thanksgiving placemat, based on clues from the text. To increase the rigor and critical thinking your students will need to do, some of the letters contain very similar clues. 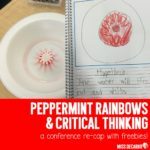 Your students will need to work on drawing conclusions and reading closely. 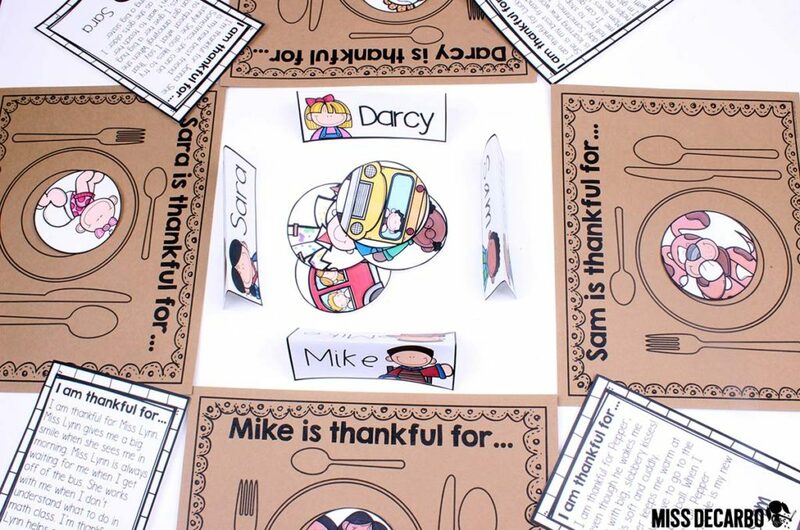 You can really “set the stage” by setting up a fun little Thanksgiving table for your lesson! This would also be adorable during your small group reading activities. I’ve even included some cute place cards. Each member of the Lunch Bunch Club even has their own signature font! TONS of differentiated recording sheets have been provided. 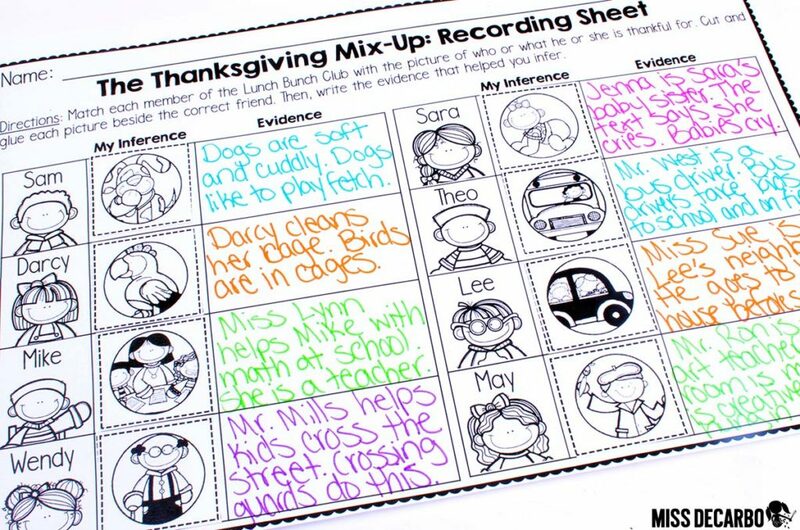 You can choose anything from a simple cut and match recording sheet, to an in-depth recording sheet that requires students to write about their schema and the clues from the text as they provide evidence for their inference. 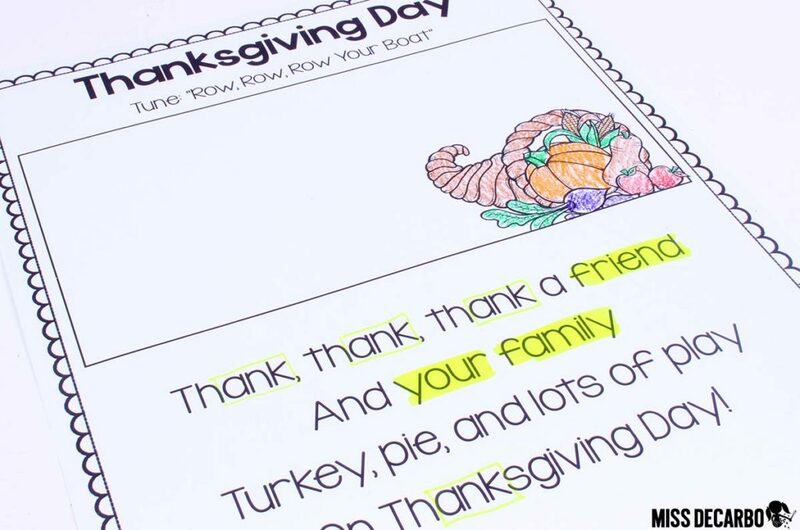 You can also complete a writing activity with this Thanksgiving idea! Students can write their own “I am thankful for” letters by providing clues for their classmates. 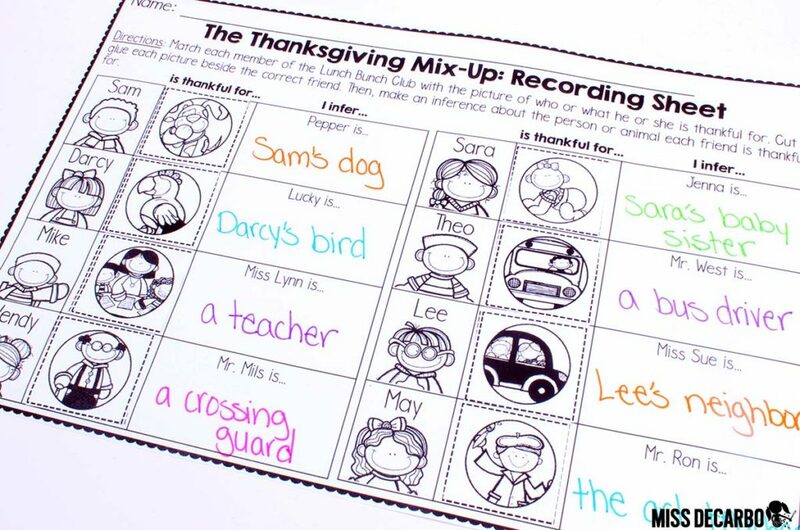 Then, students can infer who or what each classmate is thankful for. 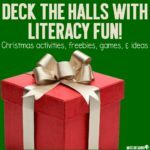 This is such a fun activity to complete the week before Thanksgiving break! The pack also comes with eight bonus Inference Riddle task cards and differentiated recording sheets. 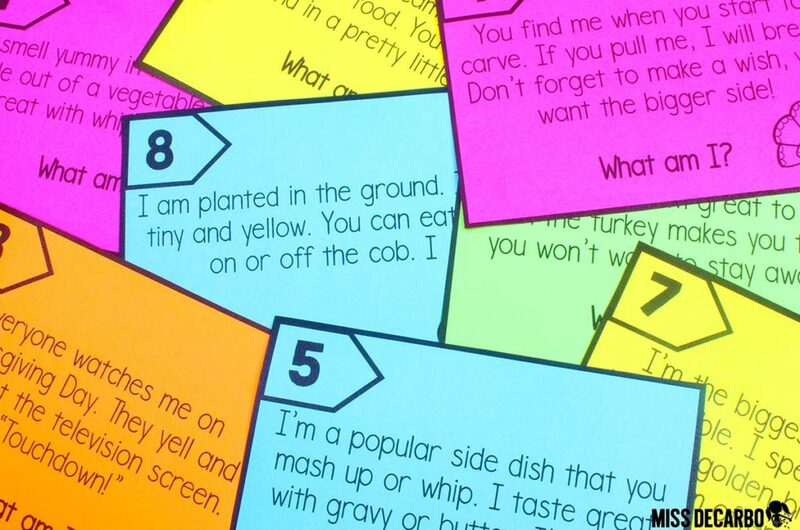 These are great to use in a literacy center, as a hook for your lesson, or as a fast finisher activity. 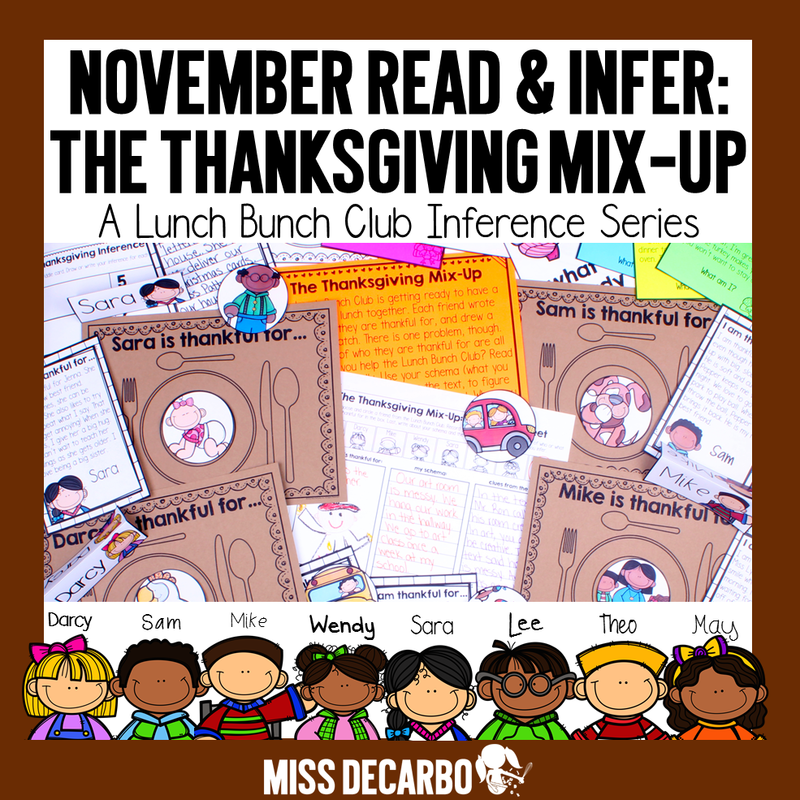 You can find my November Read and Infer Thanksgiving Mix Up resource in my store by clicking on the image below. 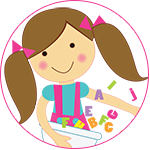 This pack comes with super fun partner plays that are perfect for struggling or beginning readers. 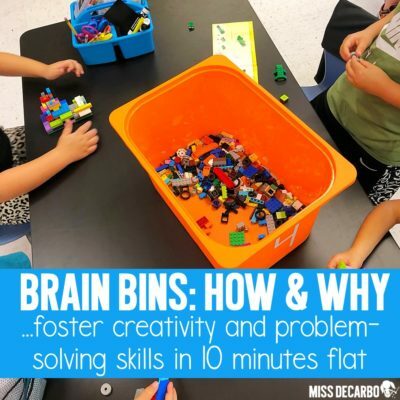 I love them because they are only one page long, which is truly great for students who need to increase reading confidence and may get overwhelmed with long readers’ theater scripts. 5 Thanksgiving reading passages are included, too. Each passage has picture cues to help struggling, beginning or at-risk readers. The students will read the passage three times for fluency practice. Phonics spinners are SO fun to use as small group warm-ups. November’s edition focuses on beginning blends. Students love to SING! (…and, let’s be honest. I do, too!) 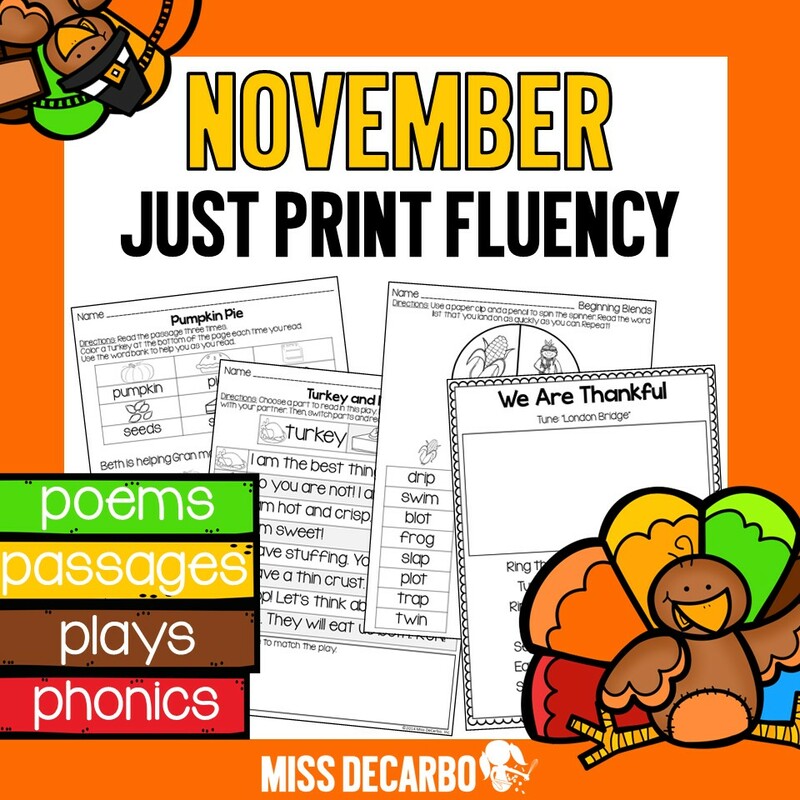 These fun Thanksgiving poems and songs will fill your room with such a happy sound! I love to integrate grammar, sight words, and word work into the poems and songs by having students highlight different patterns we are focusing on for the week. 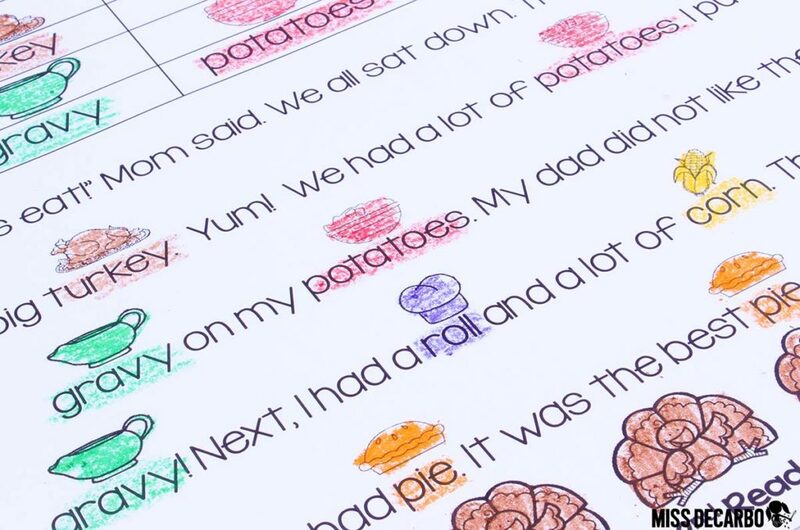 Instead of just teaching your students isolated Thanksgiving facts, use the holiday as an opportunity to teach fact vs. opinion. 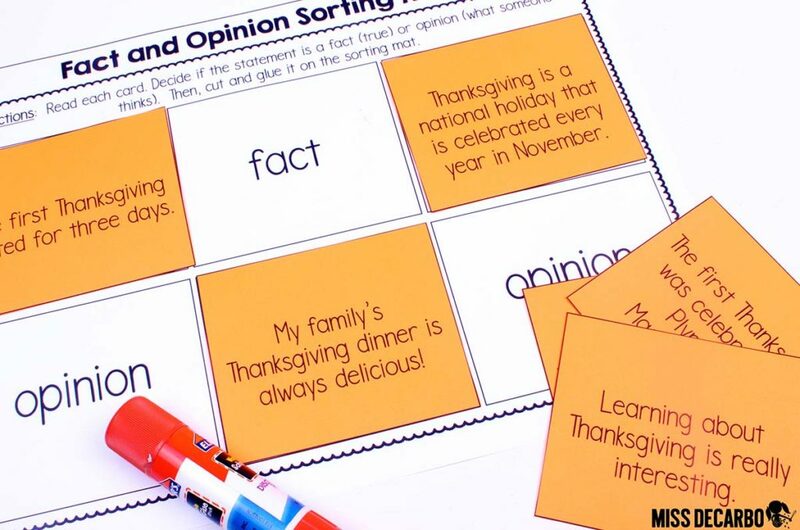 I love using this little Fact and Opinion Sorting activity from my Thanksgiving Writing Pack. Just click here and get my fact and opinion Thanksgiving activity for FREE! 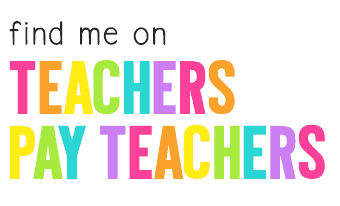 I always have a “go to” website and app for every holiday that I seem to pull into our lessons. 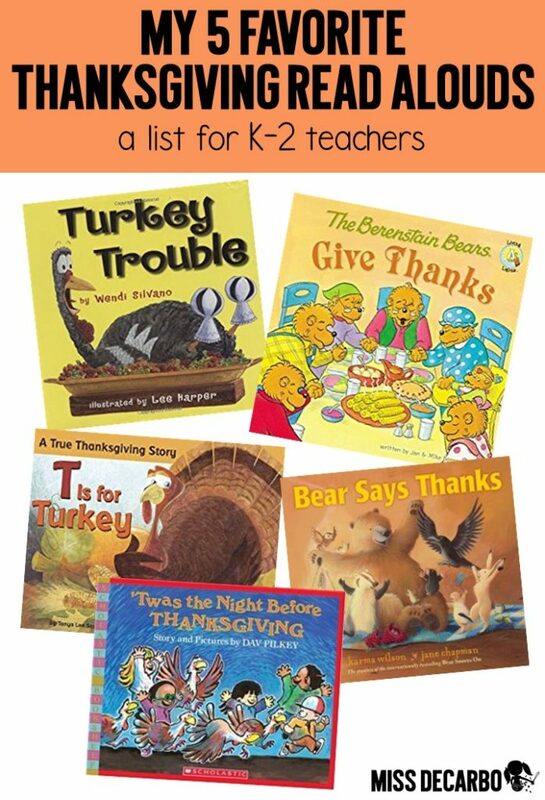 For Thanksgiving, Scholastic’s The First Thanksgiving is an amazing resource for giving your students some realistic images to view. Your students can take a tour of the Mayflower, virtually “visit” Pilgrim Village and Wampanoag Homesite, read historic letters and even watch a slideshow tour of Plimoth Plantation. 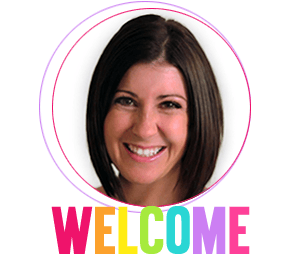 It’s truly a great website to visit this month with your students. You can find Scholastic’s Thanksgiving website by clicking HERE. The Berenstain Bears Give Thanks is a cute app that will read a story to your students while teaching them an important lesson of thankfulness. This is a great app to add to your Listening Center this month! The students can also tap on the pictures and words throughout the story. You can check out the app from the iTunes store by clicking HERE. If you’re looking for a Thanksgiving read-aloud for this month, I’ve included a list of My Top 5 Favorites for you! 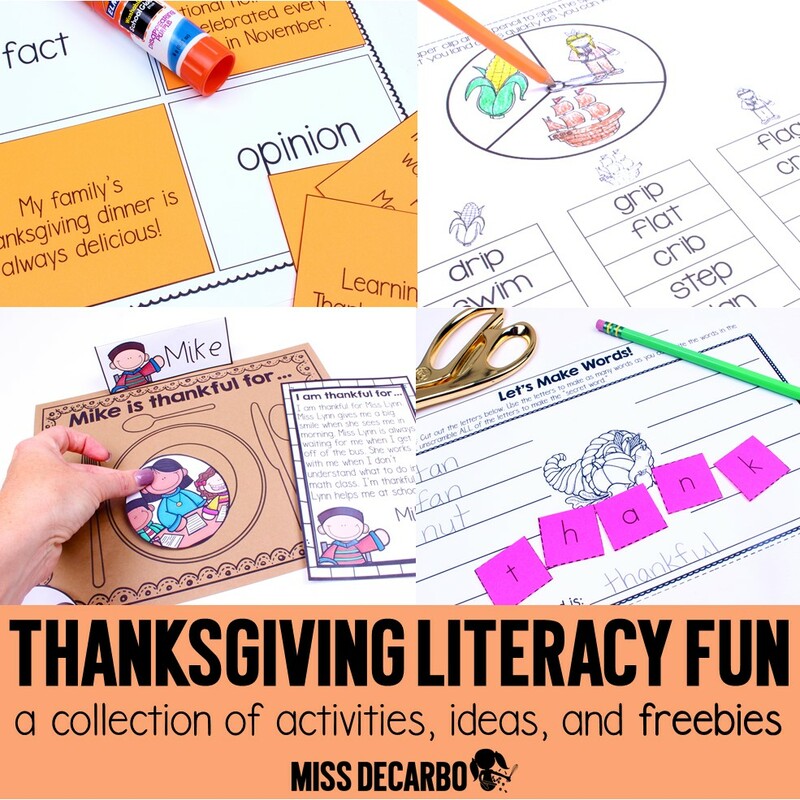 I hope you enjoyed these Thanksgiving literacy activities! 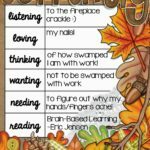 Don’t forget to pin the image below to save these ideas and freebies for next Thanksgiving, too. Thank you so much for stopping by my blog today!